Have a question for B.B House? Located in the lovely area of Central Pattaya, B.B House enjoys a commanding position in the beaches, nightlife, shopping hub of Pattaya. From here, guests can enjoy easy access to all that the lively city has to offer. A haven of rest and relaxation, the hotel will offer total renewal just steps away from the city's numerous attractions such as Big C Extra, Harbor Pattaya, Somnuk Clinic. 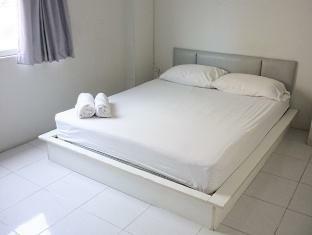 Take advantage of a wealth of unrivaled services and amenities at this Pattaya hotel. The hotel offers access to a vast array of services, including car park, room service, laundry service, bar, bicycle rental. The ambiance of B.B House is reflected in every guestroom. air conditioning, television, refrigerator are just some of the facilities that can be found throughout the property. Besides, the hotel's host of recreational offerings ensures you have plenty to do during your stay. Whatever your reason for visiting Pattaya, the B.B House is the perfect venue for an exhilarating and exciting break away. Great location, nice staff , clean but you got what you paid. Anyway its cheap and good for overnight stay. we've enjoyed our stay and will come again. Possibly the worst hotel experience I have ever had.The rooms you show in the photo's are not actualy available and it was these photo's that I based my booking on. There was no bed sheet or blanket to cover me and when I asked, the staff simply pointed to the towel for me use as a blanket. Can you tell me what other hotels anywhere in the world are like this cos i cant think of 1. Also, there was no toilet paper and a permanently flooded bathroom and I was laughed at when I asked for paper. How could this be an acceptable standard ? The staff is friendly but room is quite like the monthly apartment. No water, no soap, no tissue paper.